Students in Appellate Decision Making act as judges to resolve actual cases before the New Mexico Court of Appeals. 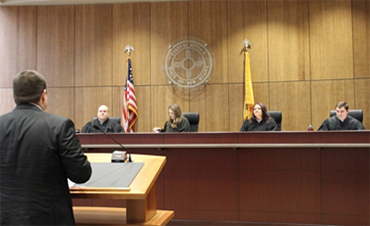 In what’s likely the only class of its kind in the country, New Mexico Court of Appeals judges teach students how to think like a judge. 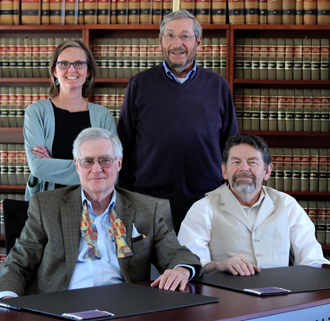 In Appellate Decision Making, UNM Law School students learn how judges think about a case. They learn how judges go about deciding a case and how they collaborate. This process gives them insights into being able to practice before the trial and appellate courts. They become better lawyers. The class is taught by New Mexico Court of Appeals Judges Michael Bustamante and Jonathan Sutin. It’s held at the Court of Appeals, located next to the law school. Sutin initially pitched the idea of the class to the law school and several people contributed along the way. He and Bustamante have been teaching it for seven years. Professor Michael Browde and Nicole Banks, Bustamante’s law clerk, assist. Banks took Appellate Decision Making, as have several law clerks in the New Mexico Court of Appeals and Supreme Court. Bustamante says that as far as he knows, there is no other class like it. “Judges from around the country are in awe of this class,” adds Sutin. Throughout the semester, students act as judges to resolve actual cases before the Court of Appeals. The first day of class, they are divided into groups of three and assigned a case. They study it, analyze the facts and issues, and research relevant case law. They spend weeks working on their opinion about the case and receive critiques from the judges on their writing. New Mexico Court of Appeals Judges Jonathan Sutin and Michael Bustamante (seated) teach Appellate Decision Making, assisted by Professor Michael Browde and Court of Appeals Law Clerk Nicole Banks. Towards the middle of the semester, the students have an experience they’ll never forget. They don judges’ robes and hear oral arguments about their case in the Court of Appeals Courtroom. They are encouraged to be an “active bench” – to ask questions and respond to the advocates’ arguments. It’s not an easy class. “Students don’t get the hang of producing a really good product, but they do learn the process,” says Sutin. “They learn to appreciate the role of a judge. They learn not to be intimidated,” he adds. Guest speakers include judges from the Court of Appeals and from the New Mexico Supreme Court, as well as district court judges and practicing attorneys, who discuss appellate practice, judicial selection/elections, differences between the Court of Appeals and Supreme Court, and other topics.